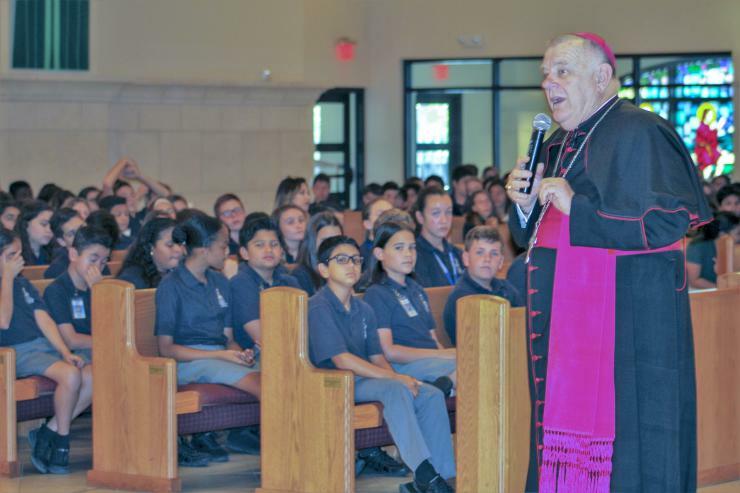 Archbishop Thomas Wenski talks to sixth graders during Focus 11 vocations rally Feb. 27 at host St. Gregory Parish in Plantation. Students join in activities during the Focus 11 vocations rally Feb. 27 at host St. Gregory Parish in Plantation. 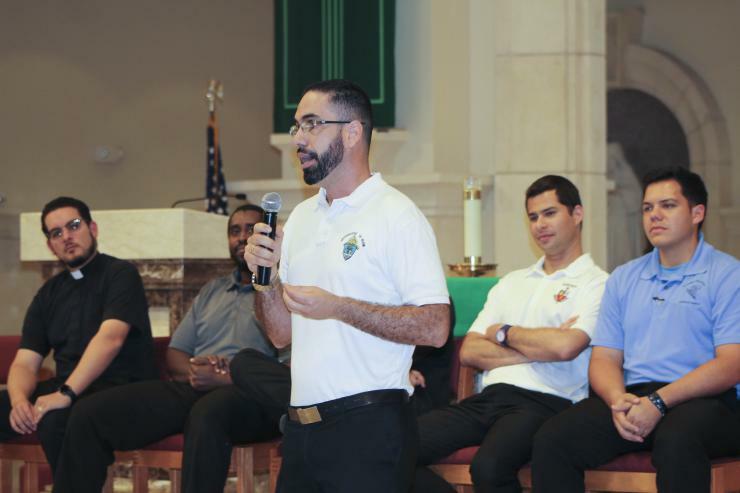 Seminarian Leo Siqueira shares his story about being called by God during the Focus 11 vocations rally Feb. 27 at host St. Gregory Parish in Plantation. Sixth graders enjoy talks by seminarians during the Focus 11 vocations rally Feb. 27 at host St. Gregory Parish in Plantation. Father Elvis Gonzalez, director of vocations for the Archdiocese of Miami, processes with the Blessed Sacrament at the conclusion of the Focus 11 vocations rally Feb. 27 at host St. Gregory Parish in Plantation. Seminarian Hans Chamorro answers questions from students during lunch. The students were attending Focus 11 vocations rRally Feb. 27 at host St. Gregory Parish in Plantation. PLANTATION | The Archdiocese of Miami held a special event in February focused on a spunky young age group. “My desire is to plant the seed. The Lord will do the rest,” said Father Elvis Gonzalez, archdiocesan vocations director and organizer of the Focus 11 vocations rally, designed for youngsters around the age of 11 from the archdiocese’s 47 Catholic elementary schools. The 2019 rally, held in three different sessions to better accommodate the more than 2,500 youngsters attending, began Feb. 25 and 26 at host St. Agatha Parish in Miami. A Feb. 27 rally followed at St. Gregory Parish in Plantation with nearly 800 students from 18 schools participating. 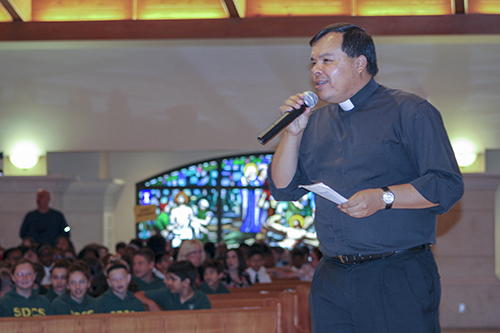 “I have been holding the rally since 2012,” said Father Gonzalez about the annual program, aimed at introducing sixth-graders to the meaning of vocations and increasing the odds of them finding the special purpose God has in mind for them, whether it be marriage, parenting or single life, or even life as a religious brother or sister, priest or deacon. Seminarians Leo Siqueira, Enzo Rosario Prendes, Gustavo Santos, Leo Siqueira, Nicholas Toledo, Hans Chamorro and Jeremy Lully were on hand, greeting the youngsters as their school buses arrived. Members of the Servants of the Pierced Hearts of Jesus and Mary also were present, sharing their energy, enthusiasm and obvious passion for the Lord. The sleepy-eyed youngsters slowly came to life during the morning program as the sisters provided lively music and led songs, moving from pew to pew and dancing to the beat of the music. 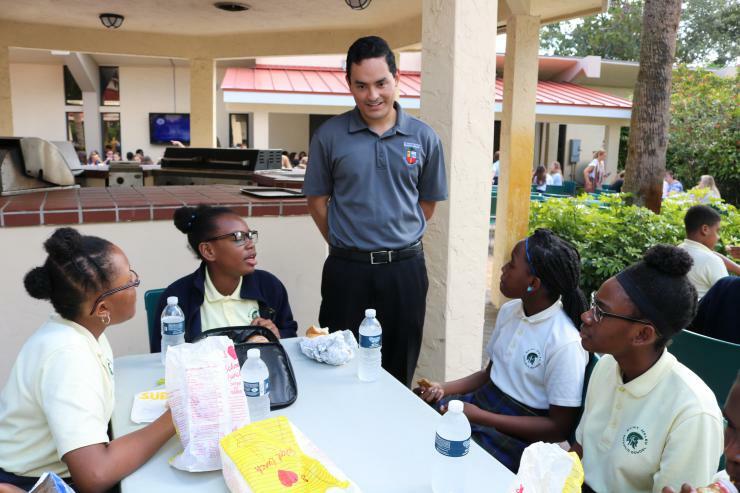 Father Elvis Gonzalez, director of vocations for the Archdiocese of Miami, welcomes students to the Focus 11 vocations rally Feb. 27 at host St. Gregory Parish in Plantation. An enthusiastic Father Gonzalez took the stage to welcome the youngsters. “You have been invited here today to meet a lot of people and at the end you will meet someone special,” he said, not revealing the honored guest of the day. He pointed to statistics indicating that school-aged children about the age of 11 or so begin to think about their future, including youngsters who may have a calling to the priesthood or religious life. He then asked the children to focus and listen throughout the day to what God might be telling them though the Holy Spirit, and through the words of program participants. “Today ask God what do you want me to do with my life? What do you want me to be? Whatever God is asking you to be, don’t be afraid,” Archbishop Wenski said. During a mid- morning break, the children enjoyed lunch outside on the school grounds. The seminarians mingled and chatted with them, and the break gave children a time to socialize with their classmates and other young participants. 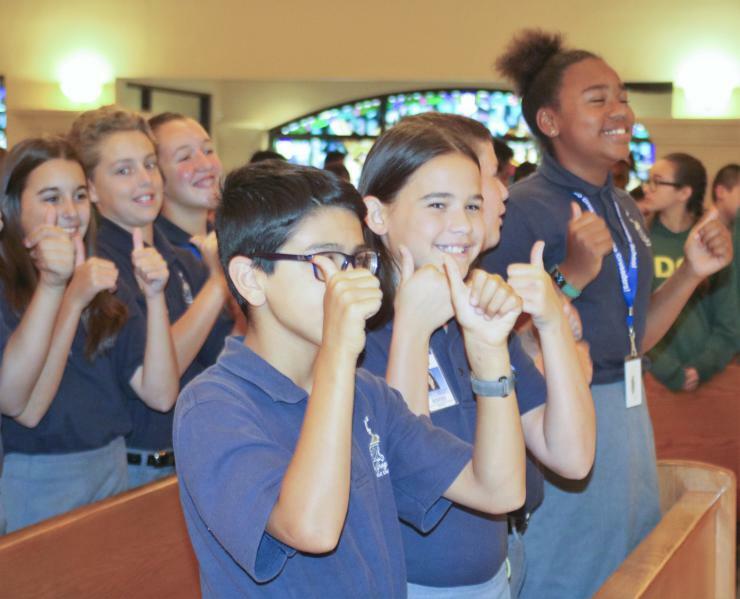 Sixth graders enjoy talks by seminarians during the Focus 11 vocations rally Feb. 27 at host St. Gregory Parish in Plantation. After lunch, the girls went to the school gym and the boys gathered in the church for more activities and discussions. During the girls’ session, the Servants spoke about their callings from God to live as consecrated religious. Some of the young women were postulants continuing to discern the call. There were also some novices who had received their habits and continue their formation. During the boys’ afternoon session, Father Bryan Garcia, administrator of St. Bernadette Parish in Hollywood, and Msgr. Michael Souckar, pastor of St. Andrew in Coral Springs, participated in discussions. The seminarians helping with Focus 11 sat in on the talks and one-by-one shared testimonies about their encounters with the Lord, and the nudging that finally led them on a path to the priesthood. At one point, youngsters directed questions to the young seminarians, such as how many years it takes to become a priest and the advantages and disadvantages of the ministry. Jonathan Castroman, a student at St. Lawrence School in North Miami Beach, was curious and a bit skeptical about the actual calling of God. “Does God rally talk to you,” he asked seminarian Chamorro. “He is going to call you,” explained Chamorro, now in his fifth year of formation. He explained that he heard God loud and clear after intensifying his prayer life. He thought he would be a doctor, he said, but struggled with that idea after feeling God pulling his heart in another direction. “God is going to be persistent. God is there, and he is always calling,” explained Chamorro. Father Gonzalez then processed around the church with the Blessed Sacrament displayed in a large, gold monstrance. He held Jesus high over the heads of the youngsters kneeling in the pews. 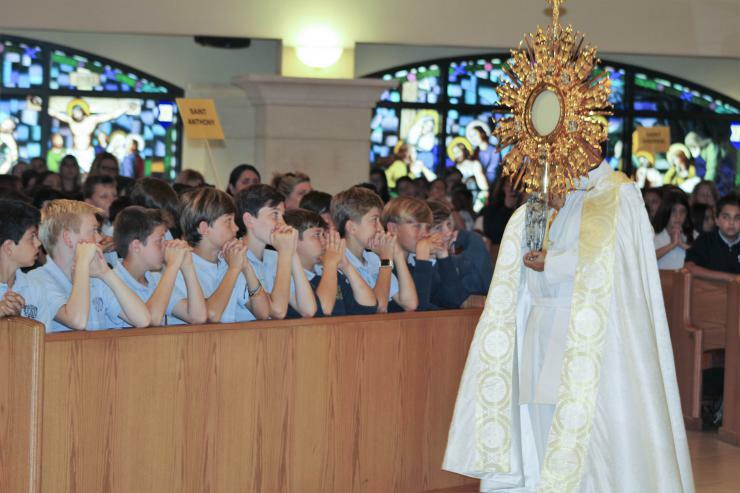 Reaching the sanctuary, he placed the monstrance on the altar, giving the youngsters a chance to encounter the Lord and personally direct silent questions to him. “Today is all about planting the seed of vocations in these boys and girls,” said seminarian Prendes, who is looking forward to ordination as a deacon in 2020, and as a priest in 2021. Father Elvis Gonzalez, director of vocations for the Archdiocese of Miami, processes with the Blessed Sacrament at the conclusion of the Focus 11 vocations rally Feb. 27 at host St. Gregory Parish in Plantation.